In the late afternoon of April 22, 1889, acrowded train carrying hundreds of would-be homesteaders arrived from Purcell. As the frenzied hopeful late-comers jostled their way onto the makeshift platforms, there emerged one tall, solitary figure dressed in black from head to foot. The Rev. Nicolas F. Scallon, attired in the priestly traveling garb of the day, made his way along the dusty trampled paths toward the newly formed Oklahoma City. Already tents and crude wooden lean-tos had been erected along what was soon called Main Street, Fr. Scallon set about locating each Catholic settler, as well as possible places in which to celebrate Mass. In fact, many of the first Masses were celebrated in a tent which housed McGinley's General Store. On one occasion after a heavy rain had turned the red dirt of the unpaved streets into a soupy mix of mud and horse manure, Fr. Scallon excused the ladies from attending Mass. He kindly noted that the muck would certainly soil their skirts. Less than two weeks after The Land Run, Fr. Scallon and his fledgling flock of 16 families began plans to build a church. For $225 they bought three lots on "Blue Hill." so called because of the small blue wildflowers that blanketed that part of the prairie. Work on the 24-x-40-foot wooden structure began July 1, 1889. The cross was placed atop the spire July 31. The $101 bell was hung Aug. 2, 1889. On Aug. 4, the 650-pound bell for the very first time rang out its joyful call to worship for all to hear. Across the recently settled prairie town - rich and poor, old and young - paused momentarily, and considered each his own journey with God. As the warm summer breeze filtered through the white wooden walls of Oklahoma City's first Catholic Church, the happy tones of the big bell faded. At once, pioneer priest Fr. Scallon commenced to intone the first Mass in the new building for the recently formed parish of St. Joseph Catholic Church. Who among those families worshiping there that day could have envisioned the stately Coffeyville brick edifice which would, within a few short years, evolve from that simple structure? 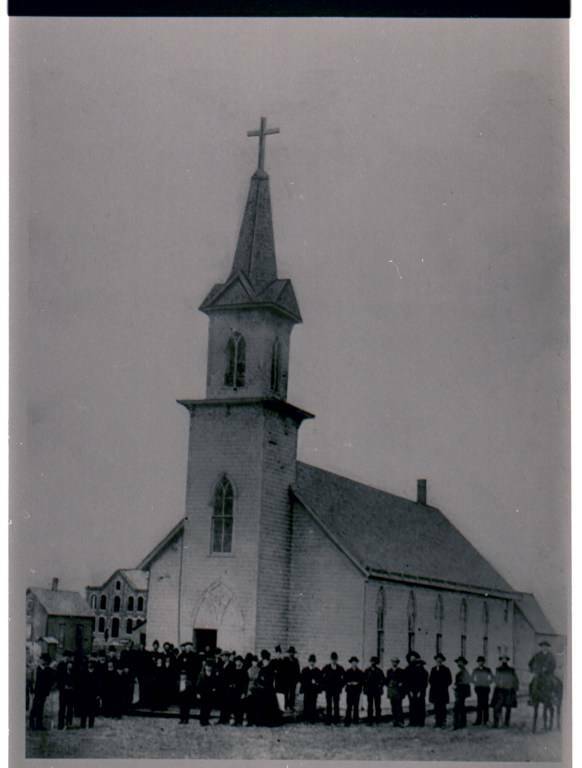 In fact, St. Joseph soon outgrew its wood-framed building. On Oct. 19, 1901, excavation began for the foundation of a 137-x-64-foot brick building. This new church was solemnly dedicated by Oklahoma's first Bishop, the Rt. Rev. 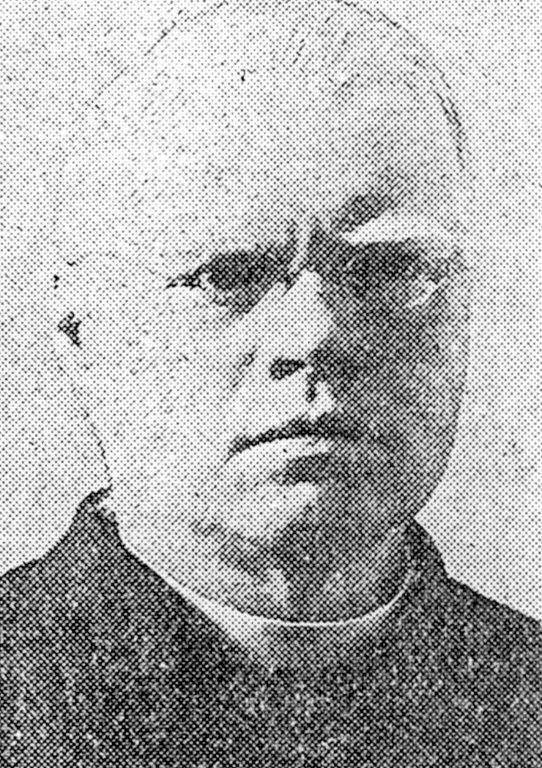 Theophile Meerschaert on Dec. 18, 1904. Fittingly, lumber and pews from the original St. Joseph were used in the new church. The grand bell found a new home as well from which to proclaim its joyous call to worship. 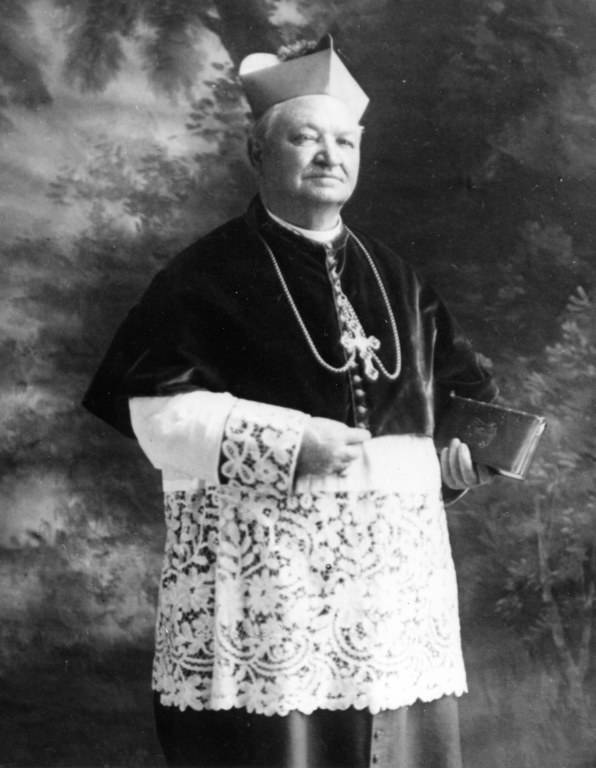 In 1905, Pope Pius X raised the Vicarate of the Oklahoma Territory to a diocese. Thus, did St. Joseph Church become the first cathedral in Oklahoma. Over subsequent decades, the church building, both inside and outside, has undergone several renovations, and has been remodeled numerous times. The most extensive restoration project, however, was necessary by the bombing of the nearby Murrah Federal Building. The old cathedral endured tremendous damage during that megaton explosion. Amazingly, the tabernacle candle remained lit throughout the violent blast. And the beautiful old crucifix with its life-size corpus remained unscratched by the flying glass and debris. below. The explosion and implosion raised the roof several inches off its steel pillars. Many rafters were broken as well. These phenomena contributed to the breaking up of the intricately embellished plaster which covered the entire interior. Much of this three-layer thick plaster fell ankle-deep onto the floor - taking the marvelously painted, symbolic medallions along with it. After being closed for almost two years, on Dec. 1, 1996, a joyful re¬dedication Mass was celebrated in the newly restored cathedral. The happy re-opening of St. Joseph culminated in May 1997 with the solemn dedication of the "And Jesus Wept" statue. Constructed of Italian marble, this understated memorial stands as a moving testament to those whose lives were lost, as well as to those whose lives were forever changed by that one senseless act of rage. On Sept. 12, 2001, Archbishop Eusebius Beltran conducted an "interfaith prayer service" in the aftermath of yet another vicious act of violence, the Sept. 11 terrorist attacks in New York, Washington and Pennsylvania. St. Joseph was chosen as a fitting venue for this sad ecumenical gathering because of its own tragic past. Archbishop Beltran said: "This building was rebuilt as a sign of faith and remembrance of those people who were killed at the site of the Murrah Bombing. We gather here today to mourn the loss of our brothers and sisters in New York City and in Washington, D.C."
In December 2004, a special centennial Mass was celebrated by Archbishop Beltran at St. Joseph Old Cathedral. Many bishops and priests from across the country also participated. The grand old bell again rang out its joyous call to worship. Its sonorous tones were heard on that special evening not across a wild, unsettled prairie town. Rather, the sound of its happy peals soared high above a bustling city very much now a part of the 21st Century. And, as on that very first day so long ago, all who heard it, rich and poor, young and old alike, paused momentarily to consider his own journey with God. Today, St. Joseph Old Cathedral has grown into a truly vibrant and thriving part of Oklahoma's capital city. Its cosmopolitan and culturally diverse membership enlivens this growing downtown parish. Each year, hundreds of visitors from all over the nation and the globe attend Masses here. Some simply stop in to admire its great beauty and to appreciate it for what it certainly is, an enduring testament to God's ever-present love.